Western blot analysis of extracts from THP-1 and SH-SY5Y cells, untreated (-) or treated with peptide N-glycosidase F (PNGase F; +), using TREM2 (E9U8L) Rabbit mAb (Amino-terminal Antigen) (upper) and β-Actin (D6A8) Rabbit mAb #8457 (lower). TREM2 (E9U8L) Rabbit mAb (Amino-terminal Antigen) recognizes endogenous levels of total TREM2 protein. 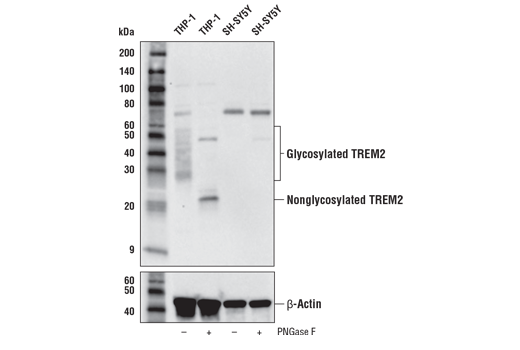 This protein does not cross-react with mouse TREM2. A non-specific band of unknown origin is observed migrating at ~75 kDa. Monoclonal antibody is produced by immunizing animals with recombinant protein specific to the amino terminus of human TREM2 protein.